These two panel oak exterior doors have pronounced top and mid rails. These rails have been trimmed out in molding. The bottom rail has been constructed in the same way; however, it has been covered by a brass kick plate as a means to protect the door from damage. The top panel, the larger of the two, is a lite--a panel in which a piece of glass, in this case mirrored glass, is set. Gilded trim work surrounds each mirror. 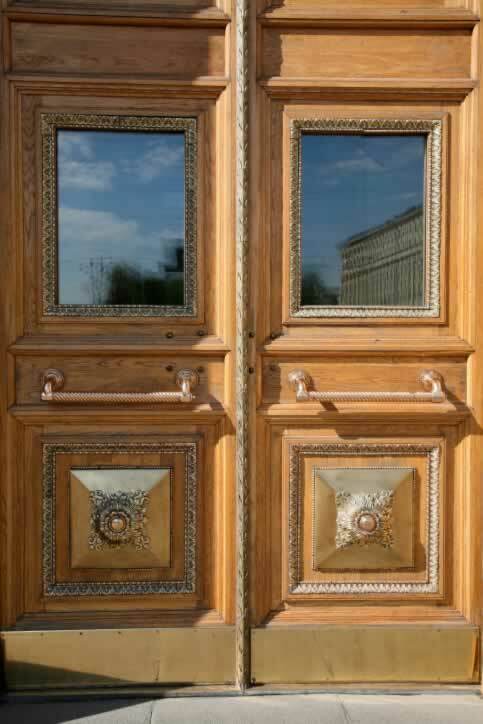 The same gilded trim can be found on the door's other panel. This square panel has a raised brass pyramid in the center, with ornate metal decoration in place of the pyramid's peak. The doors' mid rails each have a textured, copper-colored metal bar that is mounted horizontally to the door in two places. As these bars are not hinged, these doors are likely inward-opening doors.